DePalma killed his engine at the start and lost a mile. place paid $100 and 4th place paid $50. Engine Class: Not over 450 c.i. notice the motorcycle cop that followed him. some prominent drivers up in his hot-air balloon. Where they land, nobody knew. Harroun, Johnny Aitken and Ralph de Palma. the very first Indianapolis 500. And then he retired! time that many powerful cars compete in a marathon grind. a 20 y/o Indianapolis boy, who drove his first long race. 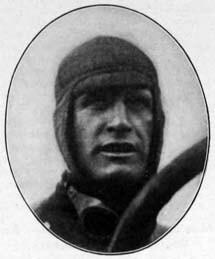 for seven years was associated with his brother, Carl G.
years. He was thirty-four years old. wife was at his side when the end came. The sun came out early, but the rest of the afternoon was cloudy and threatening, which likely cut down on attendance. Temperature was in the mid-60's. delayed racing by only a half-hour. the finish line almost together. Hearne was beaten by only a few feet. Prizes were $200 for 1st, $100 for 2nd and $50 for 3rd. 8 of the highest powered cars started. Engine Class: Not over 600 c.i. 1st place payed $75, 2nd $50 and 3rd $25. McCormich drove off the course at the end of the first lap. This race was postponed until after event 7. 12 cars started the race at 3:30 p.m.
Harroun lost a coupling on lap 168, ending his day. had driven a mile in practice in less than 37 seconds. did not make an attempt. 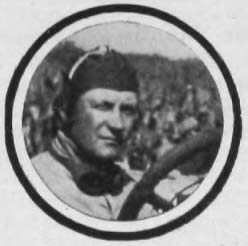 Racing was also scheduled at the Brighton Beach motordrome in New York, but was called off due to rain. Twenty-Five Pilots and 35 Cars Ready for Speedway Contests. Ormsby, Herwood, Ijon and Howard. including that for a half-mile in 32 on a two lap horse track. provided and the grassy spaces were well kept. Along the concrete wall in front of the main grandstand were beds of flowers. 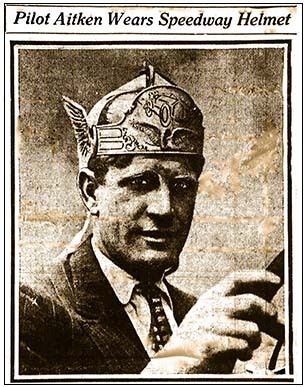 During the races, the band, composed of employees of the Maxwell-Briscoe Motor Company, Newcastle, Ind., gave a concert. Richmond, Ind. 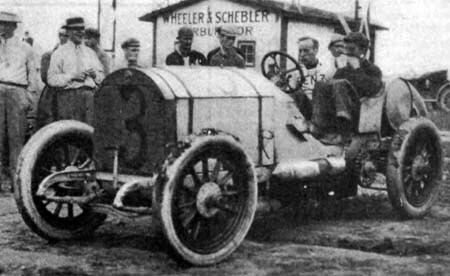 Also seen for the first time on the Indianapolis track was the Hudson and the Staver-Chicago. ran the entire race without stopping. trouble, leaving but eight cars in the race. place $200 and 4th place $100. equipped with a Remy magneto. and burned out the bearings. 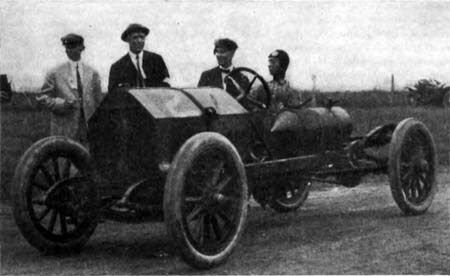 This is the car that has been built for the Vanderbilt race, with a piston displacement of 410 c.i. Electric Timing Devices accurate to a fraction were put in place yesterday.